Sen. Pete Kelly and Bart LeBon. 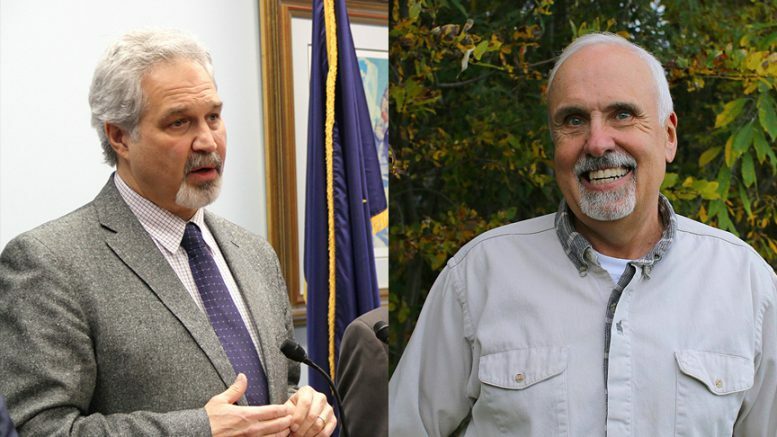 The balance of the Alaska Legislature hinges on two tight Fairbanks legislative races and just how a few hundred remaining absentee ballots go when tallied tomorrow. That’s what we’ll explore in today’s nerdy post. Fairbanks Democrats Scott Kawasaki and Kathryn Dodge captured the lead in two key legislative races after questioned and early ballots were tallied on Tuesday. Kawasaki currently holds a 152-vote margin over far-right Republican Sen. Pete Kelly. Dodge holds a 10-vote lead over Republican former banking executive Bart LeBon. According to the state, the moderate House District 1 currently has 217 absentee ballots to be counted while the more conservative House District 2 has 123 uncounted absentee ballots. Dodge is running for House District 1, and Senate District A comprises both districts, meaning Kawasaki and Kelly are awaiting the outcome of the combined 340 ballots. Those votes won’t be added to the overall tally until Friday (with the final tally of the last stragglers of the mail-in ballots coming the following Wednesday), but that’s never stopped a blogger with too much time on his hands from giving it a guess on how it’ll break down. First, there’s the conventional wisdom that absentee voting in these districts tends to break in favor of Republicans. If we look purely at the 275 absentee ballots already counted in the House District 1 race and the 502 total absentee ballots that have been counted in the Senate District A race, the numbers would tend agree with the basics of that assumption. LeBon currently holds a 28.73 percent advantage over Dodge in the 275 absentee ballots that have been counted. He currently lags by 0.2 percent or 10 votes. If the remaining 217 votes break in the same way, he’ll take a 53-vote lead on Friday. The same essentially holds true for the Kawasaki and Kelly race. Kelly holds a 15.3 percent advantage in the tallied 275 House District 1 ballots and a whopping 56.8 percent advantage in the tallied 227 House District 2 ballots. If the trends hold true for both districts, Kawasaki’s 152-vote margin would shrink to 20 on Friday. Kawasaki ekes it out and LeBon regains the lead—saving the GOP majority in the House—under this scenario. But is it accurate to assume the absentee trends will hold true for the remaining votes? There are a couple different things to consider here: history and recent changes. First, let’s look at the history in these districts. We looked at the elections results for both House District 1 and House District 2 in all races that pitted a Republican against a Democrat (the 2016 presidential and U.S. House, 2014 U.S. Senate (skipped 2016 U.S. Senate because it was particularly wonky) and U.S. House as well as all “contested” legislative races (“contested” because the closest legislative race had a 10-point margin)). We found that Republicans generally held an advantage in absentee voting to the tune of an average of 6 points in House District 1 and 30 points in House District 2. The range in here varies quite a bit depending on the race and isn’t always consistent (Kawasaki, for example, had an 8-point advantage in absentee votes in his 2014 race against Republican candidate Greg Bringhurst). Remember: House District 1 gives LeBon a 28.7-point margin, Kelly a 15.27-point margin and House District 2 gives Kelly a 56.8-point margin. The other thing to consider is that the difference between the total vote and the absentee vote has never been as pronounced as it currently is in both these districts. Currently, LeBon’s percentage of the absentee vote (64.3 percent) is 14.6 points higher than his overall vote tally (49.7 percent). Kelly’s is 15.2 points higher for House District 1 (57.5 percent of absentee and 43.7 percent of total votes) and 23.4 points higher in House District 2 (78 percent of absentees and 55 percent of total votes). The biggest historical break we’ve ever seen in these districts is a measly 3.9 points for 2016 Democratic congressional candidate Steve Lindbeck, who got 33.9 percent of the absentee vote and 37.9 percent of the total vote in House District 1. Though this is admittedly the most simplistic of the back-of-the-envelope elections math, if we substitute in the historic average absentee rate for the remaining ballots things get tighter but the outcomes would remain the same. Kawasaki’s advantage would shrink to 72 votes and LeBon would win by 4. Alaska law only triggers an automatic recount when there’s a tie vote, but the state will bear the cost of a recount if a race is within 20 votes or 0.5 percent, which amounts to about 26 votes for House District 1 and 45 votes for Senate District A once the remaining ballots are counted. The deposit required for a recount of a single House district is $2,000, which would can be refunded if the recount reverses the results of the election. Non-gubernatorial candidates would have until Nov. 28 to request a recount. At the end of the day, trying to read the tea leaves on absentee ballots is generally meaningless fun. We’ll know just how the absentee ballots break on Friday afternoon. What is perhaps a more interesting question to be considering is just why the 2018 absentee ballots are so different from the historical trend. There are a couple different explanations. First, there’s the matter of the Republican organization around absentee ballots. One explanation is that organization resulted in a wave of Republican ballots arriving and being counted first and once all absentee ballots are counted, we’ll see some return to the historical range of absentee votes. This hypothesis would be borne out if the remaining ballots come in closer to the district breakdown (even if they stay generally Republican, as we would expect). If the ballots stick with their existing trend, it likely means that something has fundamentally changed when it comes to elections, and that’s likely, as was pointed out by Juneau Empire reporter James Brooks, a result of increased popularity of in-person early voting. This year, we saw very high early voting and the thinking is that it’s generally been driven by enthusiastic progressive voters. Realistically, it’s some combination of those factors and various other ones that may be just off our radar. Be the first to comment on "If absentee trends hold true, Republicans could regain leads in Fairbanks legislative races. That’s a big if."